Join us on a Journey of pure joy and Light! We sing and dance with the Devas of Nature... the faeries and elves, flowers and trees... We plunge into the icy cascades, fly from a mountain top and feel the loving arms of Mother Earth in Sacred Druidic rituals of water, wood, earth and sky. We hike through moor and mountain, forest and fountain... we may experience Dragons along the way...! Switzerland is the passageway for the legendary Druid caravans, the ancient ones, descendents of the children of Llyr and the Tuatha Dé Danaan ~ who came before from the Great mother and father in the sky. Here, the Rainbow Rays of Color will help us to channel our Higher Source. The Master Stars will help us to know where we are in the Universe. ￼to the time when all was possible... and imprint the memories of Light in our future... in the heart of the Nature of the Swiss Alps. Be prepared to be happy! Be prepared to look within your Self – deeply. Be prepared to express your Soul radiance to Earth and Sky! Faery/Shaman Terres Unsoeld, initiated by the High Druidic Priestess of the French Order, has created a series of Shamanic Journeys for Tama-Do Academy, which expand our consciousness through physical, spiritual and cosmic exploration. We call this subtle approach to the vibrational realm – Shamanism of the Light® – for it is the Light from whence we came, and where, as Souls, we are going. In this Shamanic Journey in the Heart of the Swiss Alps, Terres Unsoeld will teach the healing powers of the Devas of Nature... the faeries and elves, flowers and trees... and how to call them with their personal song. We will tune with the Light, so that we can commune with the wonderful creatures of the Faery World. We will be initiated in the Sacred rituals of water, wood, earth, fire and sky. In Sacred Circle, we will practice receiving (channeling) – as well as giving back to the group and to the Universe. Fabien Maman, the Master Guide of Tama-Do, will guide us to stand in our personal Soul Path as it relates to our Soul astrology. This Shamanic is about re-sourcing our Selves and expressing our Soul through Group and Self exploration. We will drink from the Nature the elixir of Life... to return to our lives refreshed, rejuvenated, re-confirmed and reborn! “Tama-Do” means “The Way of the Soul”, a journey toward Pure Light and love, wonder and joy. To help us along our way, Faery/Shaman Terres Unsoeld created a series of Shamanic Journeys which expand our consciousness through physical, spiritual and cosmic exploration. We call this subtle approach to the vibrational realm – Shamanism of the Light – for it is the Light from whence we came, and where, as Souls, we are going. The Shamanic Journeys of Light have been crafted to follow the first 3 levels of incarnation according to the Sephirotic Tree. The first level, the Swiss Shamanic, is linked to Malkuth, our incarnation on Mother Earth. We re-source and express our inner Light in the Heart of Nature. The second level, the UK Shamanic, is linked to Yesod, the moon, our foundation of the Universe. We practice Light memories in the energy field of our Soul amongst the Master Trees, Stones and Flowers of Beltain. The third level, the Scotland Shamanic, is linked to Tiferet, the sun, the place of Spiritual incarnation. We empower our Noble Way of the Soul as we commit to the Light of the Master Stars and Trees, Stones and Sea. Our Shamanic Journeys create the opportunity to reach far beyond our selves. In the heart of Nature we ask that each student respect and join a sacred circle created by the group, so that the finer vibrations of wonder and joy may flourish. Our teachings have been passed down from a Masters’ Lineage with love and care. We practice respect for the teachings, the teachers and the group. All expectation is left at the door so that we may enter with open hearts and open mind. The Way of the Soul ~ it’s a beautiful journey. You will be traveling into one of the most beautiful areas of Switzerland. Grindelwald is a pristine, flower- covered mountain playground in the Swiss Alps. This is the land of sparkling cascades, green forests and the Eiger, Junfrau and Monch, 3 of the highest mountains in Europe. We will see them out our window! 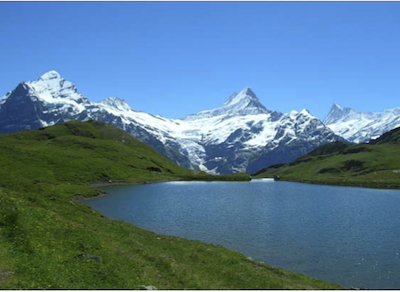 Switzerland is also the land of chocolate, cheese, and crisp clear air, green, green pastures, sparkling mountain lakes and of course, the beautiful snow capped mountains. The flower faeries are very happy! Be prepared for childlike energy. This is the land of wonder! It’s always wise to arrive a couple days early to get over jetlag. Ask about hotels for your pre-Shamanic Journey lodging. Arrive Sunday, July 8: 4 pm Arrive at the Grindelwald train station. We will pick you up. Depart Saturday July 21: 9:30am after breakfast. We will be staying in an exquisitely picturesque mountain house up one of the chairlifts. We offer double and triple occupancy and dormitory style lodging. Preference will be given to first paid, first served. Limited space available. To guarantee double occupancy, all fees must be paid by Dec 31, 2017. From the United States, you will fly to Geneva. You will take a train from the airport to Grindelwald. It is important that you purchase a Swiss 1⁄2 Fare Pass when you buy your train ticket. This will help you later with the lifts in Grindelwald. Good walking shoes; wool socks recommended for nighttime; light clothing easy to wash and dry if wet. Jeans and heavy cottons are not recommended; backpack; Sun hat and suntan lotion; Rain jacket and rain pants (or poncho); Sweaters and/or jackets for the evenings. It is usually in the 70s during the day but cold at night because we are in the mountains; Liquid soap to hand wash your clothes (there are no washing machines); little flashlight; water bottle. Good hiking sticks are required if you have weak ankles or knees! $5000 (Fee covers lodging, food, tuition and lifts up to major excursions. Not included: transportation to and from Grindelwald, lift tickets that are purchased when there is an option to walk, and additional optional excursions such as flying.) Limited Space..
Accommodation is available on first paid first served basis. Registration by Dec. 31 is recommended to guarantee the best room. Reservations are not firm until paid in full and RSVP form is handed in. Shamanic Journeys have a NO CANCELLATION – NO REFUND POLICY.